Check Out My Horse Painting! This is a painting of my dream horse Milo. I don't own a horse so i just made it like that. I think it's sort of cute. I'm sorry if it looks like a cow. I made it on paint. Comments for Check Out My Horse Painting! I don't have a horse either, but I also have a dream horse. I know how ya feel! Great drawing btw. That is awesome! So cool! Anyway, your painting is really good! Like the name too! that pic is SOOOOOOOOOOOOOOOOOOOOOOOOOOOOOO adorable! you did a GREAT job! your picture is amazing! don't let anyone ever tell you that you are no good. i was reading through some of the comments on your picture and they made me mad. no one should ever say that they are better than another person or laugh at what the artist is proud of. just to let you know, i think that it is amazing that you did that on paint. i think of myself as an artist and i would NEVER be able to do what you did. chase your dreams and get that dream horse!! :)btw, i love the coloring and the name! that picture is so cute, other people think it is lame but i don't. if people are going to say that then they are lame. oh and some people can't spell right on the computer! Aww! I think it's cute! it's good for paint but with pencil and paper you could probably do a real good one! Good for paint! I think you could to better with pencil and paper. that's good for paint! paint is hard to draw pictures. this is amazing, who ever done this well done. That's actually really good! Especially on paint. 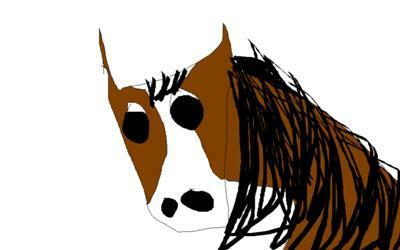 If I tried to draw a horse on paint, I doubt you could even recognize it as a horse. Great job! I think you're really good you should post some of your drawings!